I once was called in to help a bank roll out a new product, where I quickly stumbled onto a not-so-secret problem hampering the bank’s overall performance. No one trusted the vice-president’s ideas or directives. Why? Though the woman inhabited a very commanding corner office, she was “organizationally challenged.” Her desk was a mess and she often set files on the floor to “sort out later”. Though she claimed she could find anything, she often couldn’t. That isn’t unusual — Newsweek estimates that the average American spends 4.6 hours every week searching for lost or misplaced items – but her “hunt time” cost the organization valuable time as multiple people waited for her to find needed paperwork for meetings, etc. As her clutter took on greater and greater proportion, coworkers labeled her a hoarder. They judged her harshly because of this, suggesting “off-record” that they did not believe she could lead, make good decisions, or even function in that mess. The clutter quickly became the elephant in the bank’s boardroom as well as in her office. Is this an extreme example? An OfficeMax study revealed that 90% of participants felt that clutter negatively impacted their lives, and 77% admitted that clutter hurts their productivity. As cited in Forbes: a later Adecco survey of 1,000 office workers found that 57% admitted to judging a colleague based on how organized or disorganized their workspace was. In fact, more than half described actually feeling “appalled” when passing by disaster sites, believing the coworker is probably a slob in their personal life as well. Likewise, managers often default to that same quick “office-space judgement” to determine if you’re up to the challenge of leadership or helping with an exciting new rollout. Cluttered space often signals that you’re “buried in your work”, need help with time management, or lack organizational skills. 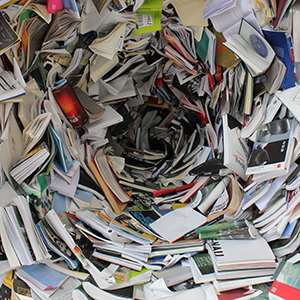 Establish work zones and standards: True productivity isn’t about how neatly you stack books; it’s about whether you have the books you need and can quickly get to them. You likely need four “zones”: 1) computer space; 2) office supply storage space; 3) library space for resource materials; and 4) archival space for files. Separate everything in your office accordingly and then set limits for those spaces. If you have a full bookcase, sacrifice outdated materials before adding new books. Create a designated place for routine office supplies (desk drawer?) and then store seldom used supplies or extras in a labeled box in a closet. De-clutter your computer; set up folders for your inbox and file/delete emails accordingly. Add three organizational items. Let’s clear off that desk and clear the floor. What would help most to do that? Do you need to add hooks to hang up a sports coat, umbrella, jacket or purse? Could you use a cork bulletin board for personal pictures or project notes? A small shelf for a stapler, electronics charging deck, and printer paper? Think of your desk as an active workspace, not a static storage area. Besides your computer and printer, you’ll want your phone, a pad and pen, picture of your significant others, cup, and what else? That’s all that need to be a constant on your desk. Everything else gets put away – in a place you really can find it. Schedule spruce up time: Once you get your zones established, either begin or end your week with a 15-minute time-out for good behavior. If everything looks good on the surface, invest that time in deleting old emails or reviewing paper files to remove outdated communications. This is a great way to review ideas and conversations, and you’ll surely find some gems that merit rediscovery, polishing, or tossing. The best news of all: IDS is curable. All it takes is a big waste paper basket and a bit of strategic elbow grease.